Member of the Spanish Arthroscopy Association (AEA). 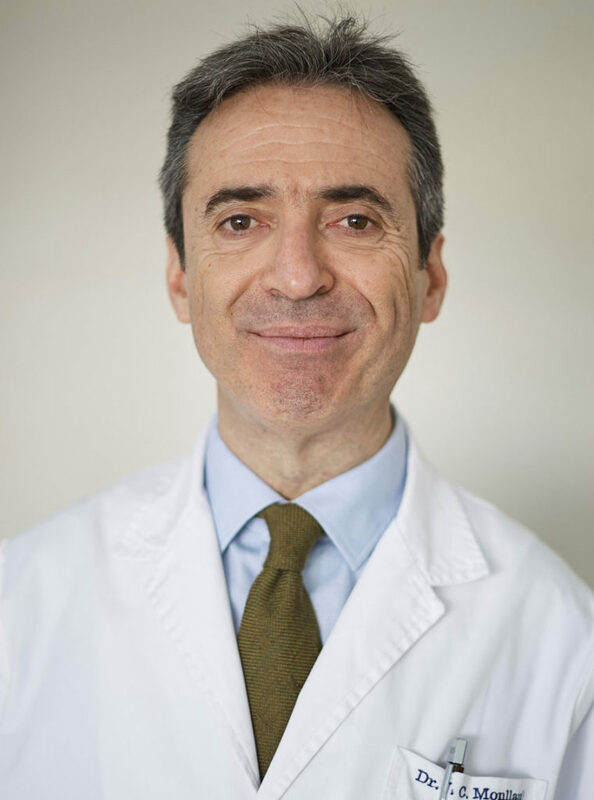 Member of the Catalan Society of Traumatology& Orthopaedic Surgery (SCCOT). Member of the Catalan Society of Sports Medicine. Member of the Spanish Society of Orthopaedic Surgery (SECOT). Member, Bone and Joint Phisiology Research Unit (URFOA). 1995: Best Presentation Award, Spanish Knee Society (SEROD). Topic: “Menisco discoideo en rodilla sintomática. Revisión de 3.000 artroscopias”. XIV Congreso Nacional de la SEROD (Sitges, 15 – 17 de Junio de 1995). 1999: Best Publication Award, Spanish Arthroscopy Association. Topic: “Resultados del Tratamiento Endoscópico del Síndrome Subacromial. Estudio Multicéntrico”. Cuadernos de Artroscopia 1994; 1, (2): 30-36. 1997: Best Presentation award, Spanish Arthroscopy Association (AEA). Topic: “Complicaciones femoropatelares tras reconstrucciones H-T-H”. XXV Congreso de la AEA (Valencia, 16-18 de octubre de 1997). 2004: Award to the best free paper, European Federation of National Associations of Orthopaedic Sports Traumatology (EFOST). Topic: “Early results of Allograft Meniscus Transplantation”. 3rd European Congress of Sport Traumatology. Madrid, 1-3/04/2004. 2005: Award to the best scientific poster, Spanish Arthroscopy Association (AEA). Topic: “Portal anteroinferior subaxilar de Burkhart”. XXIII Congreso de la AEA. Sitges, 27/05/2005. 2006. Award to the best free paper. AEA. Topic: “El Congelamiento causa cambios ultraestructurales en la red colágena meniscal. Resultados preliminares”. XXIII Congreso de la AEA. León, 10-12/05/2006. “Anomalías meniscales en la vertiente medial de la rodilla”. XXV Congreso de la AEA. Sevilla, 16-18/05/2007. Topic: “Lateral Meniscus repair including the Popliteus Tendon”. 8TH EFFORT Congress. Firenze (Italy), 11-15/05/2007. Topic: “A comparison of risk between the Lateral Decubitus and the Beach Chair Position when establishing an Anteroinferior Shoulder Portal. A cadaveric study”. Topic: “Reparació Meniscal utilitzant un sistema de sutura “all inside” i estimulació amb Radiofrequència”. Societat Catalana de Cirurgia Ortopèdica i Traumatologia (SCCOT). Topic: “Reparació de lesions condrals mitjançant una bastida tridimensional de policaprolactona. Model experimental en conilll”. Topic: “Lateral meniscus repair against the popliteal tendon. A Kinematic study using an experimental knee simulator”. 12th EFORT Congress, Copenhagen, 2011. Topic: “Resultati a medio termine di due differenti tecniche di fissazione dell’innesto nel trapianto meniscale. 4º Congresso Nazionale SIGASCOT (Societè Italiana di Chirurgia del Ginocchio, Artroscopia, Sport, Cartilagine e Tecnologie Ortopediche). Napoli, Italia. 10-2012. 2009: Award to the best free paper, Catalan Society of Orthopedic Surgery & Trauma (SCCOT). Topic: “Meniscus repair using an all inside repair and Radiofrequency stimulation”. 2010 Award to the best free paper, Catalan Society of Traumatology and Orthopedic Surgery (SCCOT). Topic: “Repair of chondral injuries by means of a policaprolactone based trimensional scaffold in an experimental rabbit model”. 2011: Jacques Duparc Award 2011 to the best scientific poster, EFORT . 12th EFFORT Congress Copenhagen, 01-05/06/2011. Topic: “Risultati a Medio Termine di due differenti techniche di fissazione dell’innesto nel Trapianto Meniscale”. Topic: “Biomechanical and Histological Study of a Patellar Tendon Repair in an experimental animal model”. Interministerial Commission of Science and Technology (CICYT) grant. Coordinated Project MAT2001-2678-CO2-02. Topic: “Macro-porous synthetic scaffolds for the regeneration of articular cartilage using tissue engineering techniques”. Interministerial Commission of Science and Technology (CICYT) grant. Coordinated Project MAT2004-04980-CO2-02. Topic: “Macro-porous synthetic scaffolds for tissue engineering of cartilage”. Topic: “Osteoprotegerin Expression in Human Osteoblasts Cultures of Osteoporotic Patients. Remodelling Process Mechanisms of Regulation. A Study of Apopthosis and Resortive Activity in Osteoclast Cultures”. Interministerial Commission of Science and Technology (CICYT) grant. Coordinated Project MAT2007-66759-C03-02. Topic: “Articular Cartilage Regeneration using a three-dimensional biodegradable scaffold. An in vivo study in a rabbit model”. Topic: “Tissue engineering of joint cartilage with synthetic scaffolds colonized by mesenchymal cells of subchondral bone”. Impingement of the Subacromial Space. R Cugat, A Ruiz-Cotorro, M García, X Cuscó, JC Monllau y cols. In: Gordon SL, Gonzalez X i Garret WE (Eds): “Sports and Exercise in Midlife”. American Academy of Orthopaedic Surgeons, 1993. Monllau JC, Tey M, Pelfort X. In: Beaufils P and Verdonk R (Eds): “The meniscus”. Combined Tibial Tubercle Realignment and MPFL Reconstruction. Monllau JC, Pelfort X, Gelber P, Tey M.
Partial chronic anterior cruciate ligaments tears. What to do. En: Sanchís-Alfonso V and Monllau JC (Eds): The ACL-Deficient Knee. A Problem Solving Approach. Springer-Verlag London. 2013 Chapter 17. ISBN 978-1-4471-4270-6. Chronic anterior cruciate ligament tear. Single-bundle ACL reconstruction. Anteromedial portal versus transfemoral outside-in versus transtibial drilling technique. Monllau JC, Pelfort X, Gelber PE, Sanchís-Alfonso V, Tey M, Erquicia JI. En: Sanchís-Alfonso V and Monllau JC (Eds): The ACL-Deficient Knee. A Problem Solving Approach. Springer-Verlag London. 2013. Chapter 18. ISBN 978-1-4471-4270-6. Clinical relevance of meniscus in the treatment of the ACL-deficient knee. The real value of meniscal transplantation. Monllau JC, Tey M, Erquicia JI, Pelfort X, Gelber PE, Sanchís-Alfonso V.
En: Sanchís-Alfonso V and Monllau JC (Eds): The ACL-Deficient Knee. A Problem Solving Approach. Springer-Verlag London. 2013. Chapter 20. pp 259-69. ISBN 978-1-4471-4270-6. Anterior knee pain after ACL reconstruction. En: Sanchís-Alfonso V and Monllau JC (Eds): The ACL-Deficient Knee. A Problem Solving Approach. Springer-Verlag London. 2013. Chapter 28. ISBN 978-1-4471-4270-6. Deep venous thrombosis and pulmonary thromboembolism after ACL reconstruction. What can we do to prevent it? Montesinos-Berry E, Sanchis-Alfonso V and Monllau JC. En: Sanchis-Alfonso V and Monllau JC (Eds): The ACL-Deficient Knee. A Problem Solving Approach. Springer-Verlag London. 2013. Chapter 33. ISBN 978-1-4471-4270-6. En: Verdonk R, Espregueira-Mendes J, Monllau JC (eds): Meniscal Transplantation. Part II Meniscal Substitutes. Verdonk R, Monllau JC, Espregueira-Mendes J. En: Verdonk R, Espregueira-Mendes J, Monllau JC (eds): Conclusion. Part IV. Monllau JC, Petersen W, Fink C, Scheffler SU, Gelber PE, Hoser C.
En: Siebold R, Dejour D, Zaffagnini S (eds) Anterior Cruciate Ligament Reconstruction. A Practical Surgical Guide. Part IV. Single Bundle Reconstruction. Gelber PE, Monllau JC, Espregueira-Mendes J. Failed anterior cruciate ligament repair. H Pereira, N Sevivas, P Varanda, A Monteiro, JC Monllau, J Espregueira-Mendes. Medial Patellar Instability. A little-known cause of anterior knee pain. Sanchis-Alfonso V, Ramírez-Fuentes C, Martínez-Soriano F, Monllau JC, Merchant AC. En: Gobbi A, Espregueira-Mendes J, and Nakamura N (eds): The Patellofemoral Joint. State of the Art in Evaluation and Management. Springer. Heidelberg. Germany. 2014. ISBN 978-3-642-54964-9. Soft Tissue versus Bone Fixation for MAT. Monllau JC, Gelber PE, Pelfort X. En: Getgood A, Spalding T, Cole B, Gersoff W, Verdonk P (eds): Meniscal Allograft Transplantation. A Comprehensive Review. Cugat R, García M, Monllau JC. Ankle Arthroscopy in cases of Impingement Syndrome. Cugat R, Cuscó X, Garcia M, Golano P, Juan X, Llusá M, Monllau JC, et al. Foot Diseases 1994; 1 (2): 157-61. Allograft Meniscus Transplantation: A current review. Meniscal Allograft Transplantation. Where are we standing? “Osteochondritis Dissecans”: A Historical Review and its Treatment. R Cugat, M García, X Cuscó, JC Monllau et al. Arthroscopy. 1993; 9 (6): 675-84. Monllau JC, Leon A, Cugat R, Ballester J.
Arthroscopy. 1998; 14 (5): 502-4. Fibrosarcoma at the site of a metallic fixation of the tibia – a case report and literature rewiew. Hinarejos P, Escuder MC, Monllau JC, Alvarez P, et al. Acta Orthop Scand. 2000; 71 (3): 329-32. Combined fracture of the talus. Arthroscopic treatment. Monllau JC, Pelfort X, Hinarejos P and Ballester J.
Arthroscopy. 2001; 17 (4): 418-21. J Bone Jt Surg. 2001; 83-A (3): 461. Tomographic Study of the Arthroscopic Approaches to the Hip Joint. Monllau JC, Solano A, León A, Hinarejos P, Ballester J.
Arthroscopy. 2003; 19 (4): 368-72. The influence of autograft removal on rabbit patellar tendon final length. Monllau JC, Alvarez P, Hinarejos P, Alameda F, Ballester J.
Fractures above and below a modular nail for knee arthrodesis. A case report. Hinarejos P, Ginés A, Monllau JC, Puig Ll, Cáceres E.
Monllau JC, Gonzalez G, Puig Ll, Cáceres E.
Puig Ll, Monllau JC, Corrales M, Pelfort X, Melendo E, Cáceres E.
Knee Surg Sports Traumatol Arthroscopy. 2006;14(4):394-8. Innervation Patterns of the Inferior Glenohumeral Ligament: Anatomical and Biomechanical Relevance. Gelber PE, Reina F, Monllau JC, Yema P, Rodríguez A, Cáceres E.
Response of human chondrocytes to a non-uniform distribution of hydrophilic domains on poly(ethyl acrylate-co-hydroxyethyl methacrylate) copolymers. Iliotibial band friction syndrome after anterior cruciate ligament reconstruction using the Transfix device: report of two cases and review of the literature. Pelfort X, Monllau JC, Puig Ll, Cáceres E.
Decreased metalloproteinase production as a response to mechanical pressure in human cartilage: a mechanism for homeostatic regulation. Monfort J, Garcia-Giralt N, Lopez MJ, Monllau JC et al. A comparison of risk between the Lateral Decubitus and the Beach Chair Position when establishing an Anteroinferior Shoulder Portal. A cadaveric study. Gelber P, Reina F, Cáceres E, Monllau JC. Benefits of arthroscopic tuberculoplasty in posterior ankle impingement syndrome. Tey M, Monllau JC, Centenera JM, Pelfort X.
Knee Surg Sports Traumatol Arthrosc. 2007 Oct;15(10):1235-9. Simvastatin and atorvastatin enhance gene expression of collagen type 1 and osteocalcin in primary human osteoblasts and MG-63 cultures. Ruiz-Gaspa S, Nogues X, Enjuanes A, Monllau JC et al..
J Cell Biochem. 2007 Aug 15;101(6):1430-8. A porous PCL scaffold promotes the human chondrocytes redifferentiation and hyaline-specific extracellular matrix protein synthesis. N Garcia-Giralt, R Izquierdo, X Nogués, Perez Olmedilla, P Benito, JL Gómez Ribelles MA Checa, J Suay, E Cáceres, JC Monllau. J Biomed Mater Res A. 2008 Jun 15;85(4):1082-9. Biodegradable PCL scaffolds with an interconnected spherical network for tissue engineering. R Izquierdo, N Garcia-Giralt, M Rodriguez, E Cáceres, SJ García, JL Gómez Ribelles, M Monleón, JC Monllau, J Suay. J Biomed Mater Res A. 2008 Apr;85(1):25-35. Freezing causes changes in the meniscus collagen net: a new ultrastructural meniscus disarray scale. Gelber PE, Gonzalez G, Lloreta JL, Reina F, Caceres E, Monllau JC. Leal-Blanquet J, Gines-Cespedosa A, Monllau JC. Cryopreservation does not alter the ultrastructure of the meniscus. Gelber PE, Gonzalez G, Torres R, Garcia Giralt N, Caceres E, Monllau JC. Symptomatic ganglions in the knee joint. Report of three cases and literature review. Vilchez F, Erquicia J, Pelfort X, Monllau JC. In Vivo Evaluation of 3-Dimensional Polycaprolactone Scaffolds for Cartilage Repair in Rabbits. Martinez-Diaz S, Garcia-Giralt N, Lebourg M, Gómez-Tejedor JA, Vila G, Caceres E, Benito P, Monleón Pradas M, Nogues X, Gómez Ribelles JL, Monllau JC. Am J Sports Med. 2010 Mar;38(3):509-19. Reduced Proliferation and Osteocalcin Expression in Osteoblasts of Male Idiopathic Osteoporosis. Ruiz-Gaspà S, Blanch-Rubió J, Ciria-Recasens M, Monfort J, Tío L, Garcia-Giralt N, Nogués X, Monllau JC, Carbonell-Abelló J, Pérez-Edo L.
Calcif Tissue Int. 2010 Mar;86(3):220-6. The effects of previous meniscus and anterior cruciate ligament injuries in patients with total knee arthroplasty. Forriol F, Longo UG, Hernández-Vaquero D, Monllau JC, Montserrat F, Valentí JR, Vaquero J, Maffulli N, Denaro V.
Ortop Traumatol Rehabil. 2010 Jan-Feb;12(1):50-7. Effect of femoral tunnel length on the safety of anterior cruciate ligament graft fixation using cross-pin technique: a cadaveric study. Am J Sports Med. 2010 Sep;38(9):1877-84. Study of the feasibility of lateral meniscal repair including the popliteal tendon with a knee simulator. López XP, Tey Pons M, Reina F, Verdier LP, Alier Fabregó A, Pavlovich RI, Monllau JC. Acta Ortop Mex. 2010 May-Jun;24(3):182-6. Good outcome after meniscal repair using an all-inside suturing system in combination with high-frequency biostimulation. Monllau JC, Leal J, Voss C, Pelfort X, Tey M, Pavlovich RI. Meniscal allograft transplantation without bone blocks: a 5- to 8-year follow-up of 33 patients. González-Lucena G, Gelber PE, Pelfort X, Tey M, Monllau JC. Torres-Claramunt R, Pelfort-Lopez X, Caceres-Palou E, Monllau JC, Puig Verdie Ll. Knee Surg Sports Traumatol Arthrosc. 2011;19:264–266. Effectiveness of a footprint guide to establish an anatomical femoral tunnel in anterior cruciate ligament reconstruction. Computed tomography evaluation in a cadaveric model. Gelber PE, Erquicia J, Abat F, Torres R, Pelfort X, Rodriguez A, Alomar X, Monllau JC. Acute haematogenous metacarpal osteomyelitis in children: a case report and review of literature. Colomina Morales J, Soria Villegas L, Monllau García JC. Case Rep Infect Dis. 2011;2011:674820. The outcome after partial medial meniscus substitution with the Collagen Meniscal Implant at minimum 10-years follow-up. Monllau JC, Gelber PE, Abat F, Pelfort X, Abad R Hinarejos P, Tey M.
Host serum is not indispensable in collagen performance in viable meniscal transplantation at 4 weeks incubation. Gelber PE,Torres-Claramunt R, García-Giralt N, Erquicia JI, Abat F, Monllau JC. Surgical treatment for early osteoarthritis. Part II: allografts and concurrent procedures. Gomoll AH, Filardo G, Almqvist FK, Bugbee WD, Jelic M, Monllau JC, Puddu G, Rodkey WG, Verdonk P, Verdonk R, Zaffagnini S, Marcacci M.
Knee Surg Sports Traumatol Arthrosc. 2012 Mar;20(3):468-86. The only-suture fixation technique leads to a higher degree of extrusion than bony-fixation in meniscal allograft transplantation. Abat F, Gelber PE, Erquicia JI, Pelfort X, Tey M, Gonzalez-Lucena G, Monllau JC. There is no relation between mild malalignment and meniscal extrusion in trauma patients. Erquicia J, Gelber PE, Cardona-Muñoz JI, Pelfort X, Tey M, Monllau JC. Injury. 2012 Dec;43 Suppl 2:S68-72. Femoral Tunnel Drilling Angles for the Posterolateral Corner in Multiligamentary Knee Reconstructions: Computed Tomography Evaluation in a Cadaveric Model. Gelber PE, Erquicia JI, Sosa G, Ferrer G, Abat F, Rodriguez A, Segura-Cros C, Monllau JC. Prospective comparative study between two different fixation techniques in meniscal allograft transplantation. Abat F, Gelber PE, Erquicia JI, Tey M, Gonzalez-Lucena G, Monllau JC. Knee Surg Sports Traumatol Arthrosc. 2013 Jul;21(7):1516-22. How to improve the prediction of quadruple semitendinosus and gracilis autograft sizes with magnetic resonance imaging and ultrasonography. Erquicia JI, Gelber PE, Sosa G, Pelfort X, Tey M, Monllau JC. Am J Sport Med. 2013 Aug;41(8):1857-63. Promising short-term results following selective bundle reconstruction in partial anterior cruciate ligament tears. Abat F, Gelber PE, Erquicia JI, Pelfort X, Tey M, Monllau JC. Reliability of preoperative measurement with standardized templating in Total Knee Arthroplasty. Hernandez-Vaquero D, Abat F, Sarasquete J, Monllau JC. World J Orthop. 2013 Oct 18;4(4):287-90. Efficacy and safety of fibrin glue and tranexamic acid to prevent postoperative blood loss in total knee arthroplasty: a randomized controlled clinical trial. Maymó RM, Martínez N, Monllau JC, Celaya F, Fernández JA. J Bone Joint Surg Am. 2013 Nov 20;95(22):2001-7. Knee joint infection after ACL reconstruction: prevalence, management and functional outcomes. Torres-Claramunt R, Pelfort X, Erquicia J, Gil-González S, Gelber PE, Puig L, Monllau JC. Knee Surg Sports Traumatol Arthrosc. 2013 Dec;21(12):2844-9. Tranexamic acid in orthopedic surgery. Aguilera-Roig X, Jordán M, Natera-Cisneros L, Monllau JC, Martínez-Zapata MJ. Rev Esp Cir Ortop Traumatol. 2014 Jan-Feb;58(1):52-6. Total knee arthroplasty in a patient with subcutaneous and intra-articular tophaceous gout–a case report. Aguilera X, Gonzalez JC, Celaya F, Jordan M, Diaz-Torne C, Monllau JC. Bull Hosp Jt Dis. 2014;72(2):173-5. Cell-free cartilage engineering approach using hyaluronic acid-polycaprolactone scaffolds: A study in vivo. Lebourg M, Martínez-Díaz S, García-Giralt N, Torres-Claramunt R, Gómez Ribelles J, Vila-Canet G, Monllau JC. J Biomater Appl. 2014 May;28(9):1304-15. Etiology of surgical site infections after primary total joint arthroplasties. Benito N, Franco M, Coll P, Gálvez ML, Jordán M, López-Contreras J, Pomar V, Monllau JC, Mirelis B, Gurguí M.
J Orthop Res. 2014 May;32(5):633-7. Magnetic resonance evaluation of TruFit® plugs for the treatment of osteochondral lesions of the knee shows the poor characteristics of the repair tissue. Gelber PE, Batista J, Millan-Billi A, Patthauer L, Vera S, Gomez-Masdeu M, Monllau JC. Molecular repair mechanisms using the Intratissue Percutaneous Electrolysis technique in patellar tendonitis. Abat F, Valles SL, Gelber PE, Polidori F, Stitik TP, García-Herreros S, Monllau JC, Sanchez-Ibánez JM. Rev Esp Cir Ortop Traumatol. 2014 Jul-Aug;58(4):201-5. Partial meniscus substitution with a polyurethane scaffold does not improve outcome after an open-wedge high tibial osteotomy. Gelber PE, Isart A, Erquicia JI, Pelfort X, Tey-Pons M, Monllau JC. Knee Surg Sports Traumatol Arthrosc. 2015 Jan;23(1):334-9. The geometry of the keel determines the behaviour of the tibial tray against torsional forces in total knee replacement. García S, Cortijo JA, Navarro I, Maculé F, Hinarejos P, Puig-Verdié L, Monllau JC, Hernández Hermoso JA. Rev Esp Cir Ortop Traumatol. 2014 Nov-Dec;58(6):329-35. Primary lipoma arborescens of the knee may involve the development of early osteoarthritis if prompt synovectomy is not performed. Natera L, Gelber PE, Erquicia JI, Monllau JC. J Orthop Traumatol. 2015 Mar;16(1):47-53. Clinical results after ultrasound-guided intratissue percutaneous electrolysis (EPI®) and eccentric exercise in the treatment of patellar tendinopathy. Abat F, Gelber PE, Polidori F, Monllau JC, Sanchez-Ibañez JM. Effectiveness of the Intratissue Percutaneous Electrolysis (EPI®) technique and isoinertial eccentric exercise in the treatment of patellar tendinopathy at two years follow-up. Abat F, Diesel WJ, Gelber PE, Polidori F, Monllau JC, Sanchez-Ibañez JM. Muscles Ligaments Tendons J. 2014 Jul 14;4(2):188-93. Bull Hosp Jt Dis (2013). 2014;72(2):173-5. Results of Isolated Lateral Retinacular Reconstruction for Iatrogenic Medial Patellar Instability. Sanchis-Alfonso V, Montesinos-Berry E, Monllau JC, Merchant AC. An experimental study of muscular injury repair in a mouse model of notexin-induced lesion with EPI® technique. Abat F, Valles SL, Gelber PE, Polidori F, Jorda A, García-Herreros S, Monllau JC, Sanchez-Ibáñez JM. BMC Sports Sci Med Rehabil. 2015 Apr 17;7:7. Femoral Tunnel Drilling Angles for Posteromedial Corner Reconstructions of the Knee. Gelber PE, Masferrer À, Erquicia JI, Abat F, Pelfort X, Rodriguez-Baeza A, Monllau JC. Topical and intravenous tranexamic acid reduce blood loss compared to routine hemostasis in total knee arthroplasty: a multicenter, randomized, controlled trial. Aguilera X, Martínez-Zapata MJ, Hinarejos P, Jordán M, Leal J, González JC, Monllau JC, Celaya F, Rodríguez-Arias A, Fernández JA, Pelfort X, Puig-Verdie Ll.Arch Orthop Trauma Surg. 2015 Jul;135(7):1017-25. Arthroscopic Treatment of Hip Chondral Defects With Bone Marrow Stimulation and BST-CarGel. Tey M, Mas J, Pelfort X, Monllau JC. Arthrosc Tech. 2015 Jan 19;4(1):e29-33. Pressure algometry is a useful tool to quantify pain in the medial part of the knee: An intra- and inter-reliability study in healthy subjects. Pelfort X, Torres-Claramunt R, Sánchez-Soler JF, Hinarejos P, Leal-Blanquet J, Valverde D, Monllau JC. The magnetic resonance aspect of a polyurethane meniscal scaffold is worse in advanced cartilage defects without deterioration of clinical outcomes after a minimum two-year follow-up. Gelber PE, Petrica AM, Isart A, Mari-Molina R, Monllau JC. An Evaluation of the Association Between Radiographic Intercondylar Notch Narrowing and Anterior Cruciate Ligament Injury in Men: The Notch Angle Is a Better Parameter Than Notch Width. Alentorn-Geli E, Pelfort X, Mingo F, Lizano-Díez X, Leal-Blanquet J, Torres-Claramunt R, Hinarejos P, Puig-Verdié L, Monllau JC. High recurrence and good functional results after arthroscopic resection of pigmented villonodular synovitis. Isart A, Gelber PE, Besalduch M, Pelfort X, Erquicia JI, Tey-Pons M, Monllau JC. Rev Esp Cir Ortop Traumatol. 2015 Jul 28. Managing septic arthritis after knee ligament reconstruction. Torres-Claramunt R, Gelber P, Pelfort X, Hinarejos P, Leal-Blanquet J, Pérez-Prieto D, Monllau JC. Deep Transverse Lateral Retinaculum Reconstruction for Medial Patellar Instability. Sanchis-Alfonso V, Montesinos-Berry E, Monllau JC, Andrish J.
Arthrosc Tech. 2015 Jun 1;4(3):e245-9.